Baral Sendu is a Redguard farmer found lying dead on his bed in The Stumbling Sabrecat, a tavern within Fort Dunstad. He was presumably killed by the bandits who have overrun the fort. He wears clothes and a pair of shoes and carries a lockpick and up to nine gold. 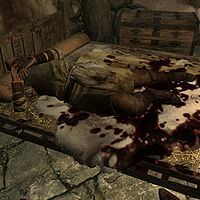 His body and blood-stained bed are removed during the course of the related quest The Battle for Fort Dunstad. Baral has the FemaleCommoner voice type. This results in a female voice if the body is resurrected.